SIGnature Events are one-day conferences for Fortune 500/Global 1000 sourcing professionals and include a delegate breakfast, a live peer-to-peer roundtable, buy-side executive presentations, panel discussions and networking opportunities. 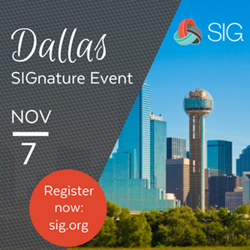 SIG is partnering with Allegis Global Solutions and ProcureAbility to facilitate this event, which will be hosted at PepsiCo Inc. Executives from Bank of America, Rent-a-Center, Essilor, Southern Glazer's Wine & Spirits and Guggenheim Partners will be among those attending. Specific sessions will be held on: Effective Workforce Strategies for the New World of Work; Procurement in the Gig Economy; and Driving Productivity Through Competency Alignment. This SIGnature event will also feature a series of rotating roundtable sessions with smaller groups of delegates discussing the topics such as: managing a remote workforce; how to attract the best talent in a tight labor market; how to improve and drive efficiency in the procurement process; the best way to optimize your supply chain management; and how are companies rethinking the way work gets done. “Our SIGnature Event program allows colleagues in a regional community to network with like-minded professionals and brainstorm on the issues that are keeping them up at night,” says Stephani McGarry, Chief Engagement Officer, SIG.